New Alexander Wang White Patent Chrystal Heels Sandals Size 37 US 7 HOT and RARE. Condition is New with defects. Check photos for imperfections. Some spots and scratches on leather but it doesn’t effect look and quality. Perfect for prom night or wedding. Please ask questions and check my other items. Shipped with USPS Priority Mail. SIZE CHART NEW WITHOUT BOX! INSOLE PEELING IN VARIOUS AREAS AND BROKEN BUCKLE PIN ON RIGHT. SEE PHOTOS. SIZE CHART. NEW WITHOUT BOX! What you see in the photos is what you will receive. Used clean smoke free home shoes shoes show some ware by toe but nice usable condition Alexander Wang Heel Sandals 38 8 Animal Print Brown. Condition is Pre-owned. Shipped with USPS Priority Mail. Strap at ankle heels. Size 39. In overall good shape. Does show some signs of wear on soles and heel as shown in images. Plenty of life left. Upper looks great. Material, clothing care, size - all will be defined. Captured reality. Our primary desire is to make your clothes fit you. We assure that you will get your desired product at the popular price. We put all our hearts in helping you to reach it. Alexander Wang Nadia Open Toe Booties Size 40. Condition is Pre-owned. Shoes show signs of wear, see pictures for details. Come in original dust bag. No box included. Let me know if you have any questions. Thank you. Brand new sandals by Alexander Wang in size 39. The color looks close to olive or army green to me. Please refer to the pictures for heel height. 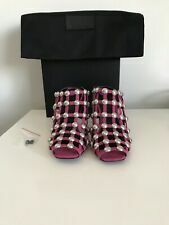 Check my other listings, I have over 200 Alexander Wang shoes and bags at a fraction of retail price! 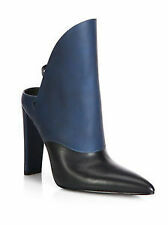 Authentic Alexander Wang Noemi Peep-toe Leather Combat Booties. Neoprene vamp. Ankle strap with concealed buckle. Covered heel counter. Leather-covered tapered heel. Polished silvertone hardware. Buckle closure. Leather footbed. Ankle strap with self-covered buckle. Brand new sandals by Alexander Wang. Size 38. There is small mark on one shoe, I’m pretty sure it won’t be noticeable when worn. It also may come if with leather cleaning product but I can’t guarantee that. Please refer to the pictures for heel height. Check my other listings, I have over 200 Alexander Wang shoes and bags at a fraction of retail price! Brand new heels by Alexander Wang. Size 36 Please refer to the pictures for heel height. Check my other listings, I have over 200 Alexander Wang shoes and bags at a fraction of retail price! We are offering a pretty pair of shoes from Alexander Wang. Stefania is a 4" stiletto with a suede heel. Size 39. New in the box, dustbags included. Used only twice. ALEXANDER WANG Womens Black Leather /Neoprene Open Toe Wedges Sz 37.5. Condition is Pre-owned. Shipped with USPS Priority Mail. Brand new without box. Size 37. Please refer to the pictures for heel height. Check my other listings, I have over 200 Alexander Wang shoes and bags at a fraction of retail price! Beautiful black leather Alexander Wang multistrap shoes with tonal suede trim, covered stiletto heels (4.25") and lace-up closures at uppers. Beige Suede Ankle-Strap "Antonia" Heel Sandals. ALEXANDER WANG. Wide Wraparound Ankle Strap. Tonal Suede Covered Side Buckle Closure. Tonal Suede Covered Heels. Five Holes at Strap. Heel: 4" Condition. The length heel to toe is 10”, the width at the strap across the toes is 3 3/4” lying flat. Color: black. Leather Platform Mules - Made in Italy. Size - 37 / US 7. Alexander Wang Peep-toe Pumps Shoes Heels Size 37 New. Shipped with USPS Priority Mail. Please refer to the pictures for heel height. Check my other listings, I have over 200 Alexander Wang shoes and bags at a fraction of retail price! No major wear, soles have slight wear, needs cleaning. Heel: 5”, Approx. In excellent condition [CHECK CHART BELOW] heel size 4". LIKE NEW 95/100. EXCELLENT CONDITION 80/100. GOOD CONDITION 50/100. USE CONDITION =40% of 100. condition of item. NEW ALEXANDER WANG Abby Cutout Leather Sandals. Alexander Wang adds his signature edge to an ankle-strap sandal spliced with a cutout block heel. A polished rose-goldtone inset highlights the architectural design for a modern touch. Black suede mules. These mules feature pointed toes, strap detailing from the toe to the top of the foot, and tall stiletto heels. Condition: Pre-owned. This item is in good condition. Light markings throughout suede. Suede Ankle-Strap "Antonia" Heel Sandals. ALEXANDER WANG. Wide Wraparound Ankle Strap. Tonal Suede Covered Side Buckle Closure. Tonal Suede Covered Heels. Heel: 4" Condition Five Holes at Strap. Minimal signs of wear at the soles and heels. Helpful Links. Mon. - Fri. 8 am to 5 pm. Material, clothing care, size - all will be defined. Captured reality. Our primary desire is to make your clothes fit you. We assure that you will get your desired product at the popular price. Leather body; Open toe. Heel - 3.5". IT Size: 37. US Size: 7. Alexander Wang Masha Women's Shoes Black Leather Double-Strap Sandals Sz 36 NEW! Designed with an on-trend chunky square heel and luxe pebbled leather upper. These edgy shoes will bring out the wild side in you. ALEXANDER WANG ALLA PEEP-TOE WEDGE BOOTIES. Alexander Wang. Wedge heel with silvertone hardware detail. Don’t wait any longer…. Ladie's Clothes. Gently worn- soles scuffed from regular wear, slight scratches throughout leather. COVERED WEDGE HEEL 4”. LEATHER UPPER, LINING AND SOLE. Alexander Wang gives this slide architectural presence with a wide band that hooks over the heel. Polished calfskin leather. 4 1/4" covered heel. Slide-on style. Padded insole. Leather lining and sole. A classic Alexander Wang style. 3 inch heels with ankle straps. I have low tolerance on heels but i find these very comfy! I can last for hours wearing them. Message me for questions! Brand new pumps by Alexander Wang. Size 37 There are few hardly noticeable scratches on leather. Please refer to the pictures for heel height. Check my other listings, I have over 200 Alexander Wang shoes and bags at a fraction of retail price! Alexander Wang strap sandals. Dark brown leather, size 37. Womens ALEXANDER WANG burgundy suede open toe heels sz. 36 NEW!